In October 07 I decided to make Dave King a hat. 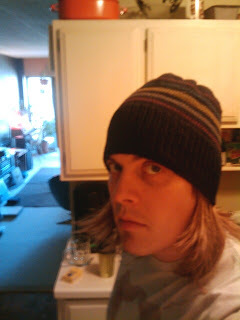 I like his music, he shaves his head and lives in Minnesota--why not do my part to keep his head warm? The whole thing snowballed, or yarn-balled, after that. Making hats for jazz musicians and others in the jazz world became an ongoing thing. It's basically an excuse for watching Law & Order reruns. Here's the list of people who have Hats for Cats so far. If you happen to find a black hat with a green stripe and a Hats for Cats label inside, please return it to Dan Eikmeier at the Dakota. It was stolen from his car last year. Just got mine in the mail! Thanks SO much Pamela! It looks and feels great, and fits wonderfully.